You are currently browsing the archives for the day Monday, January 22nd, 2018. As you already know, I am over the moon when it comes to an aventurine dial. For me, it is as infinite as the universe itself. 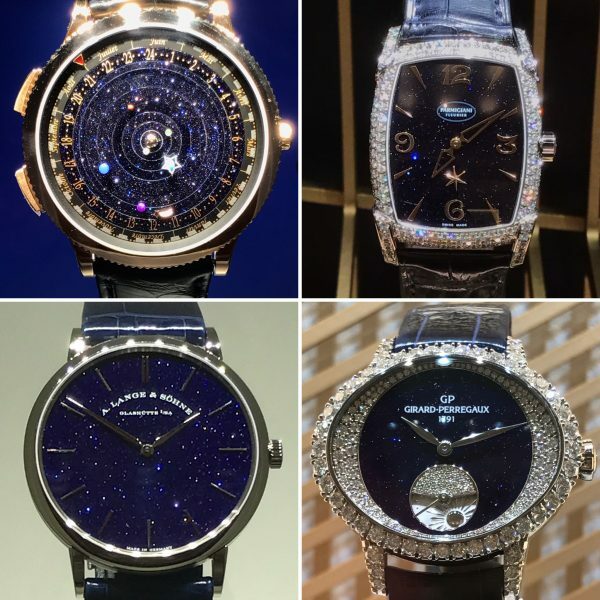 Coming back to earth, at SIHH 2018, I spotted some «out of this world» timepieces in stellar blue that I would like to share with you today. But before let me give you a little information about aventurine glass that was created by accident as it is the case for many superb inventions. In the 19th century, a glass-blower in the Italian city of Murano happened to spill some copper shavings into molten glass. This gave rise to aventurine glass, now a much sought-after material, scattered with metal inclusions and named after the Italian expression «a l’avventura», literally «by chance» – a tribute to this lucky twist of fate. 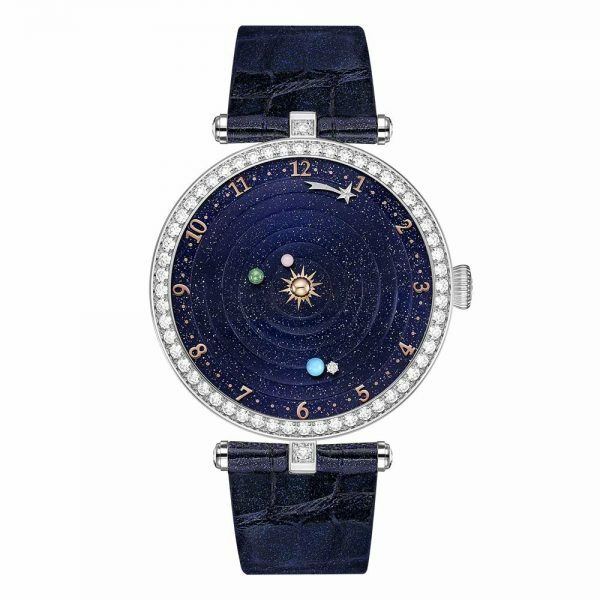 Four years after unveiling the Midnight Planétarium™ watch, Van Cleef & Arpels is restyling this iconic creation, offering an original women’s edition to enrich the universe of Poetic Astronomy. Distinguished both by refined aesthetics and its automatic movement, developed exclusively for the Maison, the Lady Arpels Planétarium watch illustrates the Sun and the closest planets: Mercury, Venus and finally Earth, along with its natural satellite, the Moon. Each heavenly body moves at its actual speed, orbiting the dial in 88 days for Mercury, 224 days for Venus and 365 days for Earth. In a key innovation for this piece, the Moon itself rotates around the Earth in 29.5 days, performing a visible celestial ballet on the dial, day after day. 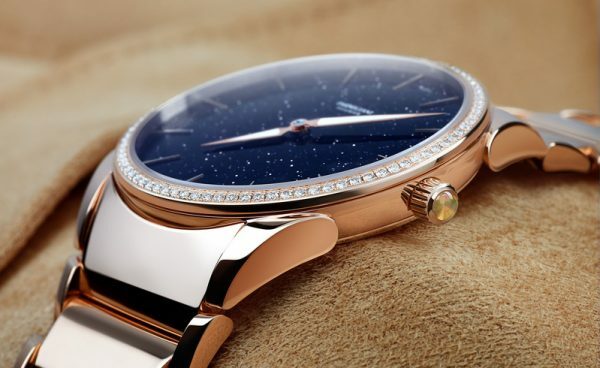 Parmigiani Fleurier is a pioneer in the use of Aventurine in watchmaking (for my favorite watch, click here please) and has numerous special editions that showcase the material on their dials. These pieces are called «Galaxy» as a reminder of the sparkling constellations evoked by the material. Likewise, the Kalparisma Nova Galaxy represents a star-scattered sky that tells the story of the passage of time. One of the principal high points of the Kalparisma collection is its small seconds at 6 o’clock, which takes the form of a star performing one revolution per minute. This little star has found its ultimate place at the heart of a dial designed to represent the galaxy. In astronomy, «Nova» refers to a star that suddenly becomes very bright. It is available in two majestic versions. 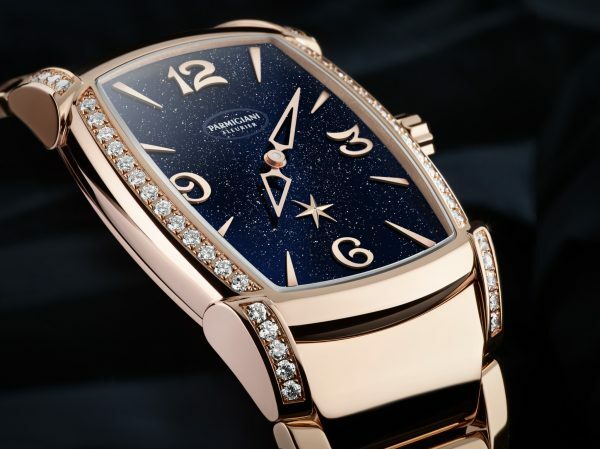 The first, in rose gold with its shimmering reflections, matches the indices and Nova star. The sides of the case are set with 46 Top Wesselton diamonds for a total of ~0.84 carats and a glittering play of light. 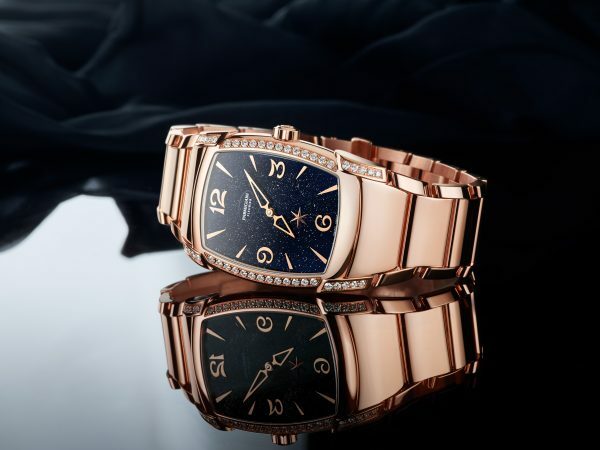 The stone-set rose gold edition is limited to 50 pieces. It is joined by the even more exclusive white gold version: a total of 8 pieces with a dazzling «snow» setting (see collage above). The entire case is set with painstakingly arranged diamonds in sizes expertly selected by the master stone-setter – smaller on the periphery, and gradually getting bigger as they near the case’s curves. Each of the 182 stones has a role to play in this ~2.28-carat fresco. 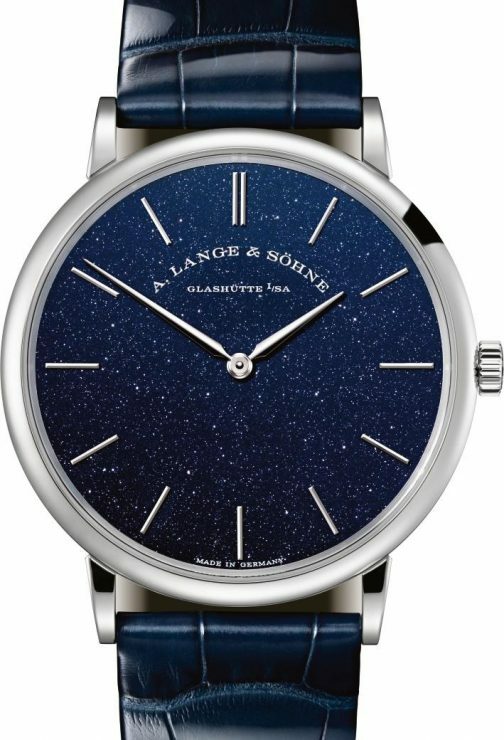 Celestial canopy for the wrist – a copper-blue dial imparts fascinating depth and charisma to the thinnest A. Lange & Söhne timepiece. The elegant personality of the latest Saxonia Thin version is based on the «less is more» principle. 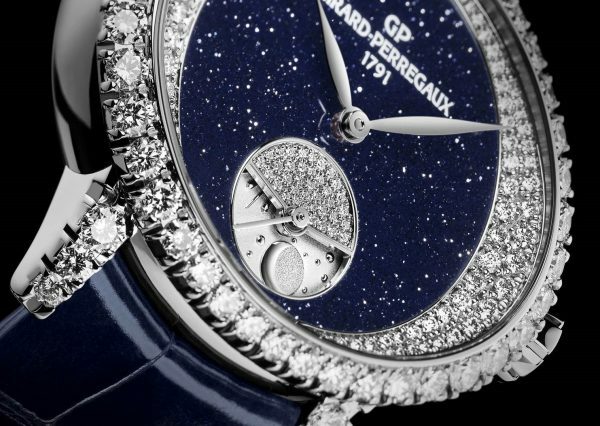 Its elegant white-gold case is merely 6.2 millimetres thick and has a diameter of 39 millimetres. The case colour is echoed by the two slender hour and minute hands as well as the twelve hour markers in rhodiumed gold. It is crafted from solid silver and coated with a thin layer of subtly shimmering goldstone. Microscopically small copper oxide crystals saturate the deep blue with choreographed reflections that are reminiscent of the stars in the blue midnight sky. 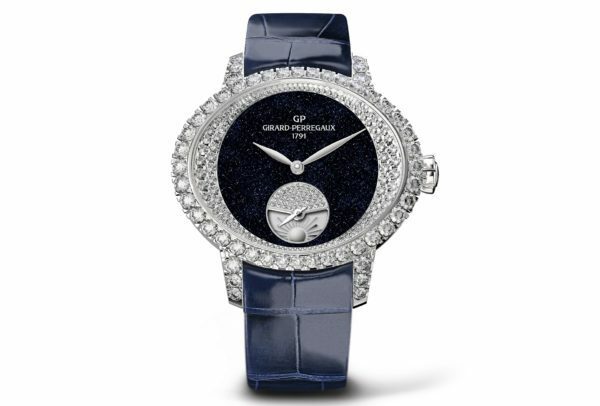 A dark-blue hand-stitched alligator leather strap rounds out the expressiveness of the watch. Its puristic elegance is complemented by a manually wound movement finished to the highest standards of Saxon watchmaking artistry. The technical features of the manufacture calibre L093.1 – it is a scant 2.9 millimetres thick – include a flat mainspring barrel which delivers a maximum power reserve of 72 hours despite its compact size. The Cat’s Eye collection is one of the most loyal ambassadors of ladies’ watches and now it has been transformed it for the very first time into a High Jewellery interpretation. Above and beyond the metamorphosis highlighting the fairytale sparkle of diamonds, this new creation tells its very own story. This stunning white gold watch comes with an aventurine night-sky, diamond paved dial and moon figure with brilliant-cut diamonds. On the dial, there are 149 brilliant-cut diamonds ~0.52 ct, on the case 52 brilliant-cut diamonds ~2.31 cts and on the buckle 14 brilliant-cut diamonds ~0.118 ct. The see-through case-back reveals the reliable in-house manufactured movement made of 218 components and the gold oscillating weight delicately engraved with «GP» logos forming a decorative pattern. My absolute favorite watch that features an aventurine dial is the Tonda 1950 Galaxy by Parmigiani Fleurier that was launched at SIHH 2017.